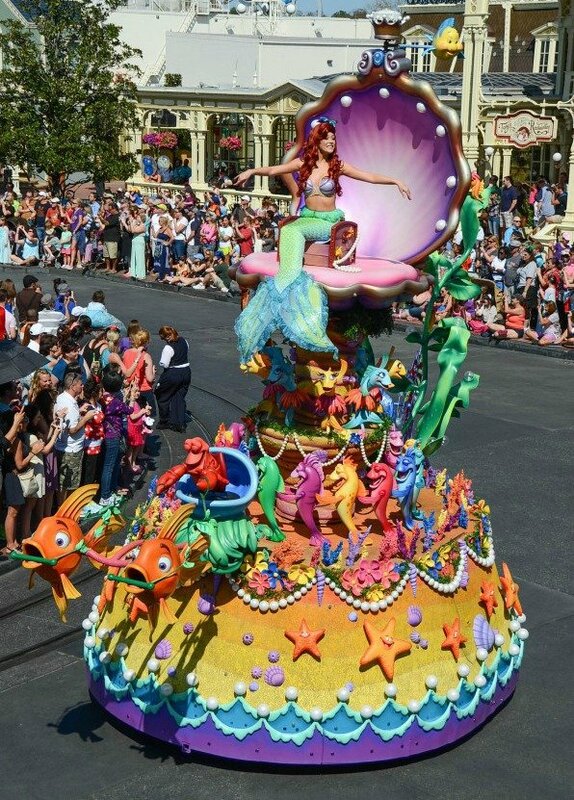 The "Disney Festival of Fantasy Parade" celebrates New Fantasyland with new innovative floats, costumes and an all-new soundtrack that features songs from popular Disney films. A new theme song has also been developed for the parade. In this parade, we see nods to The Little Mermaid, Sleeping Beauty, Dumbo, Pinocchio, Peter Pan, Tangled, and Brave, as well as many others. The floats are designed to look as if they were created by the characters they represent and truly bring each story to life as it moves down Main Street, U.S.A. This parade replaced the Celebrate a Dream Come True Parade, which ended 1/4/14. Ariel and her friends ride on an oversized music box decorated like a colorful "Under the Sea" party. Merida's float is a giant bagpipe surrounded by Scottish dancers. Joining Merida on the float are her triplet brothers, in bear form. Peter Pan and Wendy ride on a flying pirate ship, led by a replica of Skull Rock. Captain Hook, Mr Smee, Tinker Bell, and the Lost Boys are tagging along also. Rapunzel and Flynn Rider's longship sail down the street, topped by magical floating lanterns. The Disney Princesses ride on a Royal Court Garden Float. One of the most impressive floats is the 35-feet-long, 26-feet-high Steampunk-inspired Maleficent Dragon from Sleeping Beauty. Thorn stilt-walkers walk alongside as Prince Phillip tries to fight them away. Mickey and Minnie ride in a hot air balloon float surrounded by the dancing hippos from Fantasia. The parade's finale is full of bubbles and circus tent-inspired costumes! Guests who want to take advantage of VIP viewing for the afternoon parade at Magic Kingdom can book the Festival of Fantasy Parade Dining Package. The experience begins at Tony’s Town Square Restaurant on Main Street, U.S.A. where you can enjoy tasty Italian fare for lunch. Admission to Magic Kingdom park is required and is not included in the price of the dining package. You receive your voucher for the Disney Festival of Fantasy Parade Dining Package VIP viewing at the time of your meal. 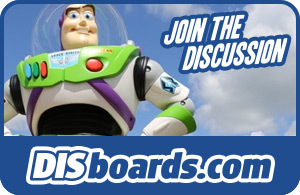 Your VIP voucher is only valid for day’s showing of the Disney Festival of Fantasy Parade. Plan to arrive for Main Street, U.S.A. flagpole 15-to-35 minutes prior to show time. The Disney Festival of Fantasy Parade Dining Package costs $54 for adults and $19 for children ages 9 and under (tax and gratuity not included). Each dining package includes an appetizer, entrée, dessert, and non-alcoholic beverage, along with a VIP viewing voucher. Reservations for this package can be made either online or by calling (407) WDW-DINE.